The Prime Minister, Peter O’Neill has expressed disgust and disappointment at the way in which the Opposition has sought to drag politics to a new low over Christmas. “I had hoped that in 2016 the nation would have a mature and responsible Opposition, but with the way Mr Polye has sought to manage his affairs in this last week of the year I expect we will be disappointed. “The people of Papua New Guinea are sick and tired of the cheap and personal gutter politics we have seen from the Opposition Leaders in this term of Parliament. 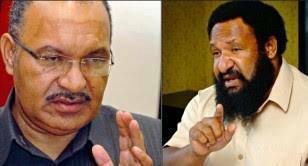 “Papua New Guineans want debate on policy on substantive issues that matter to the lives of the men, women and children of our nation. The Prime Minister made the comments after Mr Polye made a series of unsubstantiated claims in press release content over Christmas. “Be mindful that the Opposition misleads media with the expectation that some journalists will not check facts. “Polye’s latest misleading claims related to land - because he knows there is no more emotive issue in our country than land ownership. “He further continues to make unsubstantiated claims of conspiracies between government agencies, that he often claims have to do with undermining opposition. “I can assure the media who received these latest Opposition statements that there is no truth to his claims. PM O’Neill said as the nation prepares for elections in 2017, the level of public debate has to mature and rise to a new level. “The Leader of the Opposition must focus on policy alternatives and not personal attacks on Members of the National Parliament. “We have all had enough of desperate politics. If the Leader of the Opposition has nothing to offer our nation but cheap shots and slander, he should step aside for another member of the Opposition to take his place. "Is there someone in the ranks of the Opposition who can debate on policy and substance?